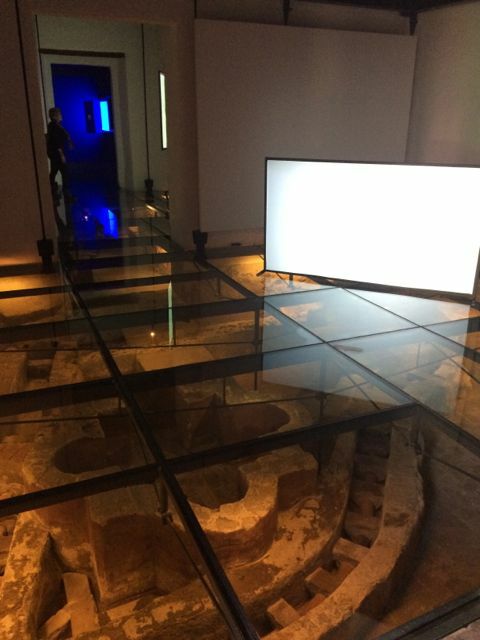 First an exhibition of video works by British artists at the fairly new Celda Contemporanea gallery which is housed within what used to be an old convent, now university, in Centro Historico. The gallery isn't your usual white cube. It's a series of rooms on top of the foundations of the 17th century nunnery. 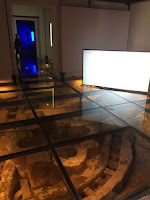 So rather than plonk a solid floor over them, the floor throughout is glass. Looks beautiful, but makes for a slightly uneasy juxtaposition of heritage below and utterly contemporary video installation above. Some might be kinder and call it a dialogue. In any case, the exhibition, Immersive Frames, curated by Javier Calderon who flits between Mexico City and London, features Elizabeth Price (Turner Prize winner 2012), Anna Barnham, Rebecca Lennon and the only bloke, Gabriel Stones. I really like Stones's animated razor-writing and wiggly band aid. 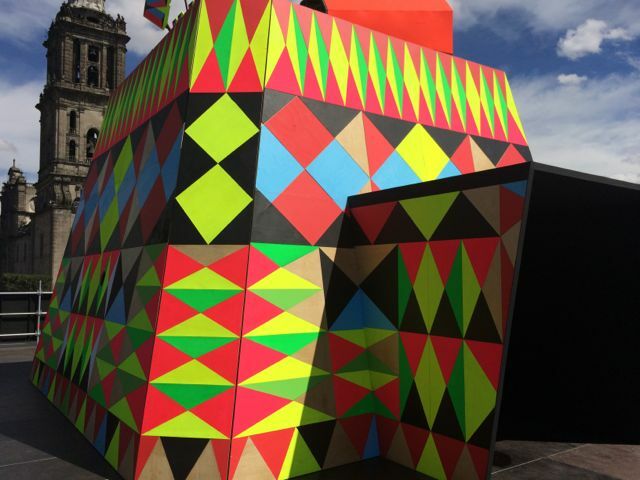 From there, cycled along the cobbled streets to see Studio Myerscough's pavilion in the Zocalo. In the last 10 years the Studio has made a name for itself for creating incredibly multicoloured pavilions, cafes, playgrounds etc. This one has a camera obscura inside. So there's a tiny hole and... (over to Wikipedia): "Light from an external scene passes through the hole and strikes a surface inside, where it is reproduced, inverted (thus upside-down), but with colour and perspective preserved". The phenomenon has been known for around 2,500 years, but I still find it bewildering that we could see what was in effect a live video of the Palacio Nacional upside down complete with traffic. The contrast between brightly coloured, modern installation in the grey, old Centro Historico was striking. I then hot-footed it to the Palacio de Bellas Artes for a talk by Morag Myerscough and partner Luke Morgan. I met Morag nearly 20 years ago when she designed a touring exhibition for the British Council, but didn't know Luke who's an 'industrial' designer and also in a rockabilly band, the Highliners (formed 1984…) with the attitude and haircut too match. Very nice couple. 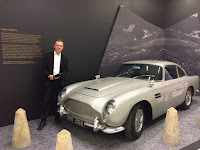 Finally to the opening of the Barbican's Designing 007: 50 Years of James Bond exhibition at the Plaza Carso not far from our home. I've seen it before, but it was cramped in Shanghai - here it can really stretch out and impress. I love Bond. The first film came out the year after I was born and I've followed them fairly avidly ever since. What's not to like? The exotic locations, brilliant opening sequences, action, cars, humour, glamorous women... they even have pretty decent story lines now. Nice to see Neil from the Barbican and designer Ab Rogers whom I last saw in Beijing three years ago. Anyway, great show, and with Spectre opening in 10 days time it should have lines round the block.